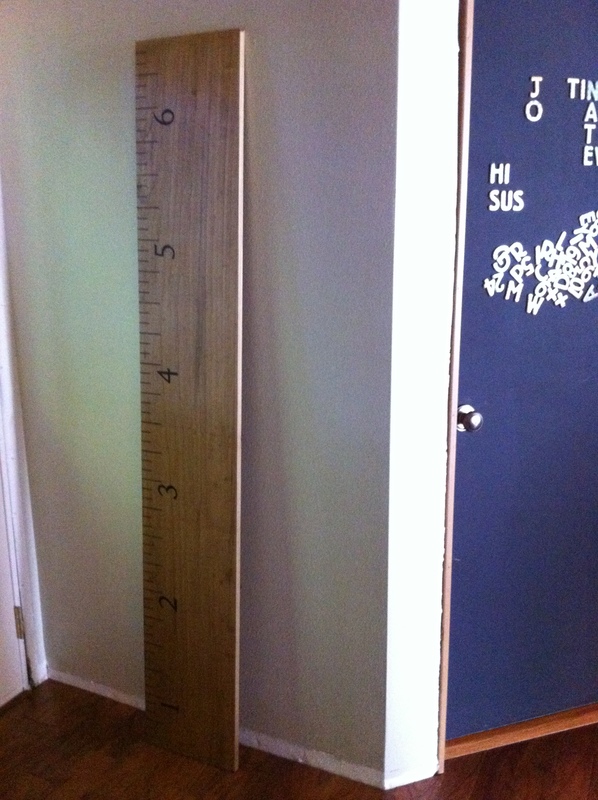 As soon as I saw the ruler growth chart idea on Pinterest (here), I knew I wanted to make one. I read it was a recreation from one that Pottery Barn Kids use to sell, and that didn’t surprise me since I love browsing their catalogs. After months of procrastination & convincing myself that I needed a larger vehicle to purchase a 6 foot long piece of wood, I finally drove to Home Depot with E in tow & our very small Corolla & picked out our wood. 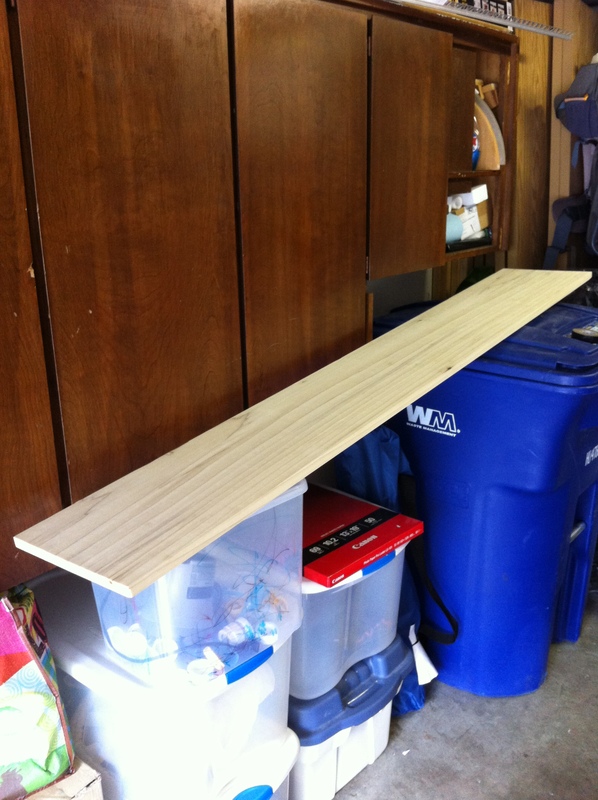 I chose a 6’x1″x10″ piece of Poplar. I could have gone cheaper with Pine (approx $12), but all the pieces were quite rough & knotty, and I liked the look of the Poplar wood (approx $30) better. …I figured it’s a project that I plan to keep around for many many years to come, so may as well fully enjoy looking at it. 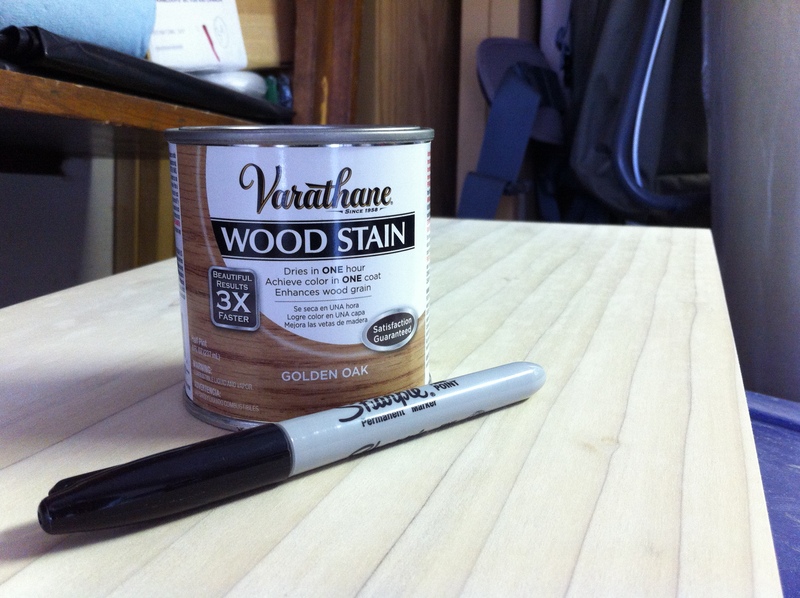 At Home Depot, I also picked up a fresh Sharpie (to ensure good ink coverage), and the tiniest pot of stain. 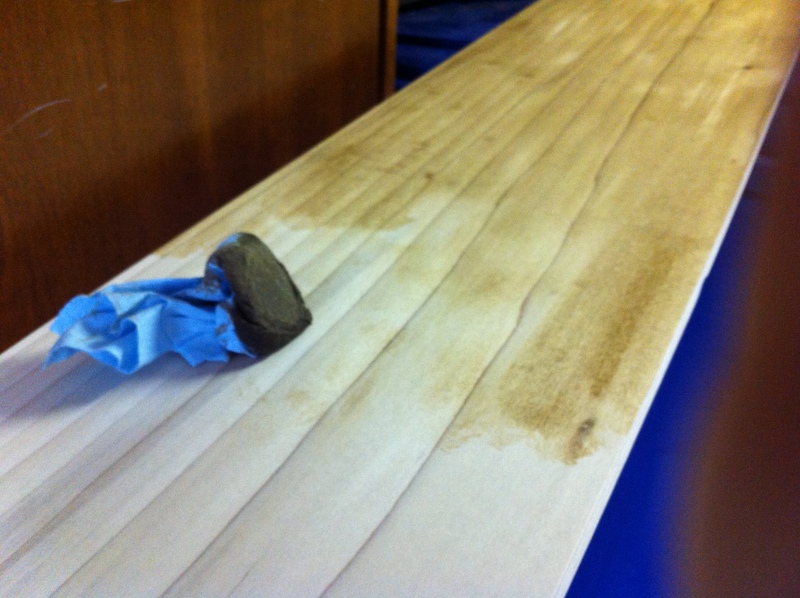 I hummed & hawed at the shade of stain to go with… so many to choose from! The lady at the paint department told me she had test pots, and showed me the 2 options I had narrowed down to on paint sticks to help me decide. The thing is that paint sticks are not made of Poplar, and she really emphasized that my stain project would look quite different. I picked 1 of the 2 options, rolled over to the checkout (E was in the carseat sitting in the cart, with my 6′ long piece of wood balanced on top of it all. Then I second guessed myself when at the register, and ran back (with baby) to the painting section to switch for a lighter 3rd option that I originally hadn’t even considered. 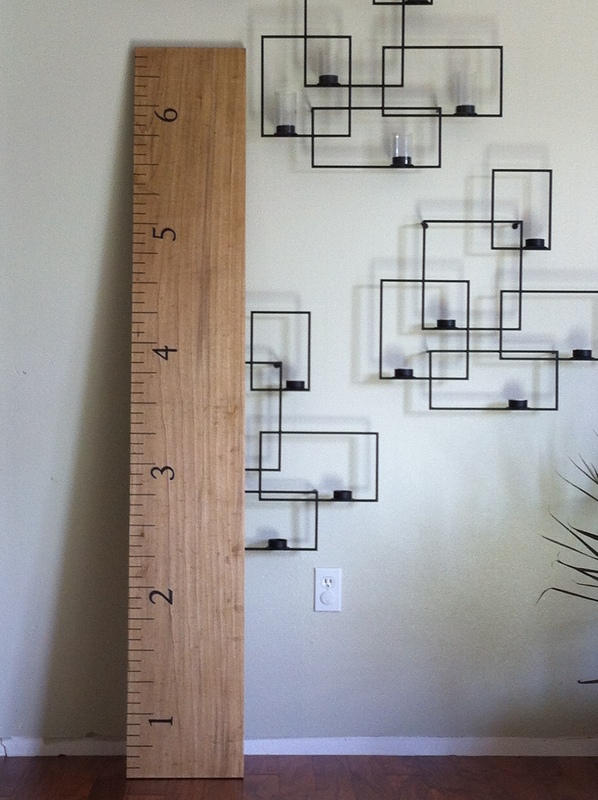 days later… finally going to create this! Baby asleep-check! 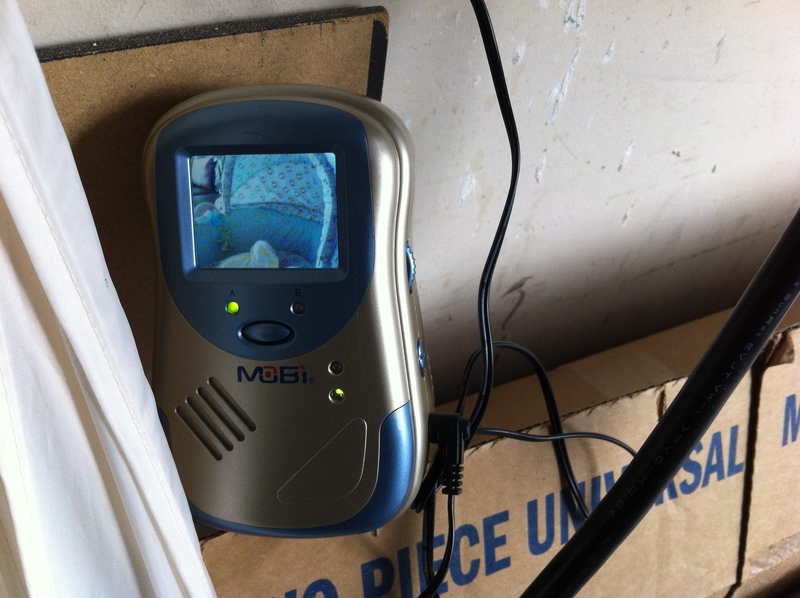 Monitor set-up to watch from the garage-check! So I started by staining the wood – rubbing off the stain as quickly as I wiped it on, as I didn’t want my project to become too dark. I did one coat & returned a couple hours later to do the other side. I planned to do only one coat, but when I later started drawing a couple lines, the ink was bleeding into the wood a little, resulting in not-as-crisp-lines as I hoped for. So, back to the garage for another coat of stain which I hoped would alleviate the problem, and it worked-phew! 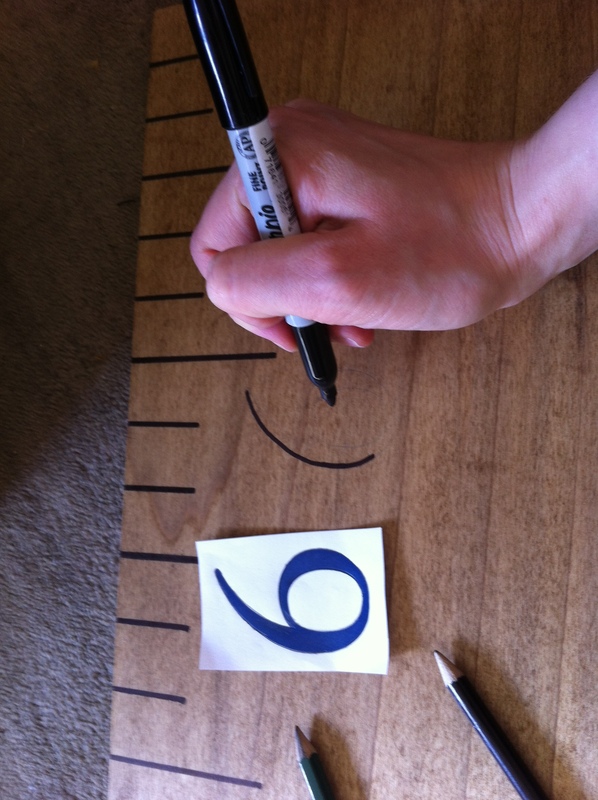 I learned very quickly that each line needed a double thick (2 lines) of sharpie to give the visual I was seeking. I choose the number font by searching many different fonts, and printed at font size 230. I actually picked my numbers from a combo of 3 very similar fonts, since I liked the ‘1’ of one font, and the ‘5’ of another, etc. 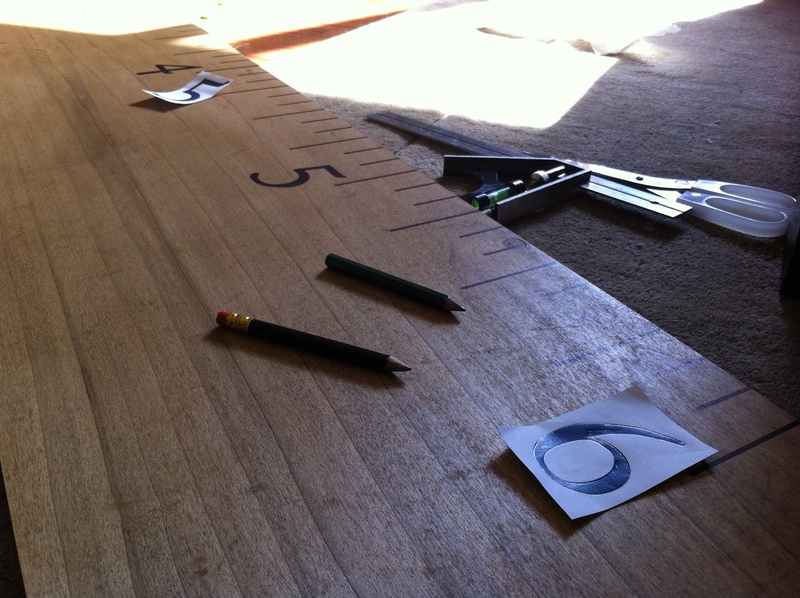 I used a pencil to shade the back of the numbers, then put in place on the wood & traced the edges with a ballpoint pen to leave the faintest indent and pencil mark to guide where I filled in with the Sharpie.